As an avid fan of any game involving deception, this one immediately caught my eye. 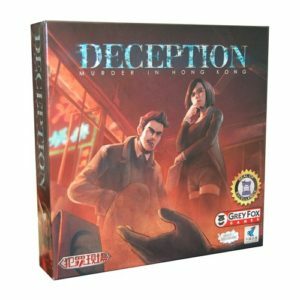 Deception: Murder in Hong Kong, is a cooperative game for four to twelve players who must work together to solve a murder. The problem is, the murder is also among you…. At the start of the game, each player received four means and four clue cards, which are placed face up in front of them, so the other players can easily read them. Roles are then randomly and secretly allocated. One player is allocated the role of the Forensic Scientist, who becomes the game master. This player places their means and clue cards back in the box, and begins play. All players close their eyes (except the Forensic Scientist) and the Murderer is instructed to wake up. This player then indicates to the Forensic Scientist one means and one clue card situated in front of them. It now becomes the job of the investigators to correctly identify the means and clue card (and in doing so, the murderer). The Forensic Scientist then draws six cards, one Cause of Death card (there is only one of these in the game), one Location of Crime card (chosen from a selection of six) and four scene cards, dealt randomly from the draw pile. The rest of the players begin to discuss who they think the murderer is, and which means and clue card they think were used, while the Forensic Scientist places bullet markers down on the available clue cards. Each clue card has six different pieces of information on them, so the information indicated by the bullet is to be used as a clue to help the investigators solve the crime. It also means that the order of clues given, and the way in which they are given are also clues. You might think that this would lead the investigators to a sure fire win, but it’s easier said than done! Many of the hints could indicate multiple cards, and the two cards you need to identify might be so different that you struggle to link the investigators to both, without accidentally sending them in the wrong direction. The game plays over three rounds, each round concludes when the final bullet has been placed, and is followed by each investigator presenting their theories, having the opportunity to make a guess, and then the Forensic Scientist swapping out one of the four scene cards for a new one. We played a few rounds of the game, and it can get quite complex! It really relies on understanding what the player leading the game is thinking, and working out what they’re trying to tell you with their hints. The could be indicating one of the cards, hinting at which player is the murderer, or even trying to bring you back from heading down the wrong path. Some of the means and clue cards are quite unusual too. In fact, the definition of what is a means and what is a clue can be quite loose. Trying to push your team towards selecting a bottle of wine and a nail is much more demanding in practice than in theory. You’re also restricted by the cards you draw which are used to offer hints. While you might find indicating an area on the corpse, or the duration of the crime quite useful, it’s much harder to to infer meaning to the time of day or day of the week! 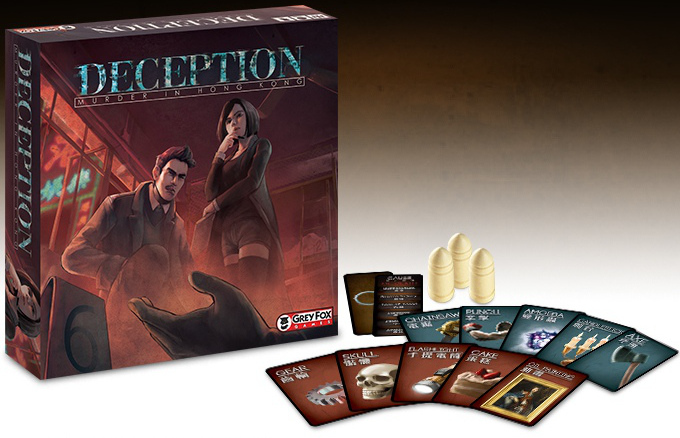 Deception: Murder in Hong Kong, also includes a few additional roles to make the game more interesting with more players. The Accomplice knows who the Murderer is, and must help sway the investigation away from truth, although they do not know which means or clue card the team must identify. This gives the Murderer some support in games of more than six players, which does help to balance out the teams. The second role is the Witness. This player knows who the Murderer and Accomplice are, but does not know which is which, or which means or clue cards the team must identify. They can help sway the investigation in the right direction, but if the Murderer is caught, and the Witness is correctly identified, the Murderer and Accomplice still get away with the crime. These additional roles add interesting group dynamics in larger games, and are very welcome additions! If you’re still not satisfied and want to add even more to the game, some additional, special scene cards add in extra special events if drawn. Shuffled in with the other scene cards, when an event card is drawn, instead of placing a bullet as a clue, you immediately resolve the effects of the card. These can help reduce the amount of evidence (means and clue cards) you need to sift through or provide extra hints. Overall it’s an unusual game. It has similarities to Avalon, but roles are stripped back, and the concept is completely different. Some of the means and clue cards work better than others, as do some of the scene cards. With an unlucky draw on both sides, you might struggle to really get into the game, but after a few rounds, we had some really fun games! I like the way that Deception: Murder in Hong Kong plays, it’s something different, but still feels like a standard game of lies and deception. If you’re a fan of Avalon or Resistance and are looking for a change, we’d recommend giving this one a go. We can see a few things that could be tweaked to make the game cleaner, but it’s still a great, quick to learn, and quick to play party game. The RRP for Deception: Murder in Hong Kong is £37.99, and it can be found at independent game stores, which can be found using this store locator.